There are so many good ideas in this book that I wish I could give it more than five stars. I guarantee you will be inspired and have a lot of fun with your practice. 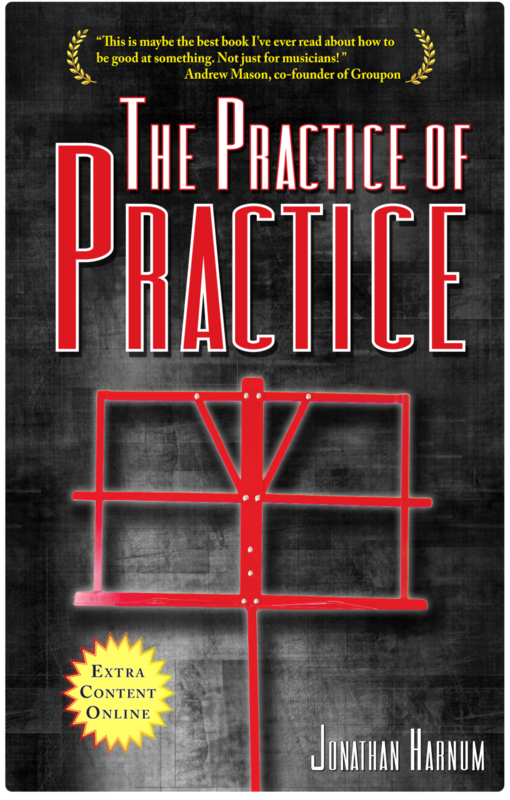 Even if you have 30 books on practicing, it's worth adding this one. I loved it immediately. The short, digestible chapters, the clear and useful language. The ideas were pretty “out of the box” from traditional classical practice techniques and I liked that alot. I felt like the book not only talked about ways to practice, but also ways to love practicing music. I found myself inspired and curious after each chapter. It has now moved to the top of my recommendation list for my students and now I’m recommending it to you. Even if you have 30 books on practicing, it’s worth adding this one. There’s even an e-book which is awesome. Thank you so much for writing your Practice of Practice book! I bought the book after checking out a link from your Music Theory book, and it's such an eye-opening game changer. The realization shifted everything for me. Today, I can hope to fail better. Thanks for writing such an amazing book, and I'm going to buy it again and again, to gift it to many artists. It's a wonderful service and extremely helpful. Ripped through this in 2 days. Jon has brought together a deep, thorough, thoughtful, funny, inspiring, provocative, humble and understated collection of information and motivation to help anyone get more out of their love of creativity in art and music. His tips, "extensions" of information into the multimedia, popular culture, and scholarly literature were worth the book alone; but when combined with a gentle, positive, experimental, and generally loving tone, this is a knockout book. I am going to be very happy to put this into the hands of my family, friends, and frankly anyone I know who is wanting to or spending any amount of time with their creativity through art. I highly recommend this book for musicians of all levels. As a high school music teacher I think this book is an invaluable resource to not only share with our students to read themselves but also create lessons and strategies to teach our students how to practice. Practical, useful, entertaining and highly recommended (5.0 out of 5 stars). This is both a practical guide to new ways to practice and a fascinating look at the psychological and physiological processes involved. That is, not just WHAT to do in the practice room, but WHY and HOW it works. Lots of short, easily absorbed chapters written in a clear, entertaining style. This is the first book I've purchased which takes advantage of the ebook format to a full advantage in that there are many links to articles, videos, and other resources which are available in context. So, if you read on a tablet or PC you can click through as you read and see or hear the author's references on the fly. For that reason, I'd say the electronic version is superior to the printed copy, though you can enter the links manually if you like. I read through it quickly the first time, and will now read again more slowly to get the "meat" out of this truly valuable resource. I recommend it to all my adult students, and use the material in all my teaching. I look forward to diving deeper into the material in this fine addition to my library. It does exactly what book on musical practice is supposed to do: motivates you to practice! I started reading it the second time and this time around I wanna follow all the supplemental material where he provides the links to videos and interviews and such. The book itself I enjoyed reading a ton. It got me started on a slow practice routine and I see improvements in my playing after a very short time. I especially like how Jon dispels the myth of in-born talent and the notion that only an extraordinary talented person can become top musician. Rather he explains it is the set of extraordinary circumstances but most importantly extraordinary dedication. The book also has many simple but effective advices about how to make your practice more productive. It motivated me to push even harder with on my musical journey. Well-written, Easy Read with concise practical guidance. I met the author at a gypsy jazz guitar conference. He's bright, fun, and an insightful musician and teacher. 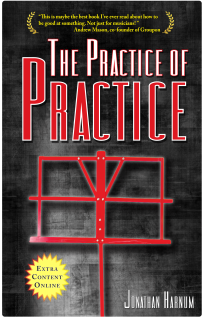 I read "The Practice of Practice" on the plane home & I loved it. It's witty, well-organized, and fun to read (and I usually don't like reading). Well worth it. I will likely buy the print edition. A breath of fresh air into the age old practice, practice, practice. The book is as valuable neural-psychologically, as it is musically. There are many useful tips regardless of what instrument one plays. Many Apps, and various other on-line supplements are provided for those wishing to expand outwards from the book. Supporting studies back up everything Harnum recommends. Reading this will give you many new and interesting ideas to include when you practice. Your overall musicianship will improve and practicing will be more fun. Thanks Jon. An interesting and entertaining read. Many useful insights, not only for music practice, but for general use. Just finished the book and plan to keep it as a future reference. Lots of good stuff made its way in here. Good ideas to polish your attitude towards practice, perspectives from diverse sources, and techniques and strategies to squeeze the most out of your precious practice time. I like how the author seems to emphasize the importance of balancing a goal oriented practice with having fun. Not a lot to find negative about this one. Not instrument specific, so maybe if you're looking for exact exercises to work on you won't really find that here. A little conceptual at times, but that's fine by me. Reading this has made me reconsider the ways in which I practice guitar and, I think, improved the effectiveness of my practising.